Your prize is a Dessert Roll of my newest line of fabric Snowman Gatherings, that is NOT in the stores til April, but I happen to have a few pieces of it and I am giving you the new Dessert Rolls from Moda…they are 20 prints- 5×44″! The whole line can be seen here if you love, snowmen, little prints or blues and creams!!! Snowman Gatherings… You can pre-order an pre-cuts to make sure we don’t sell out as soon as they arrive!!! I hope you didn’t think I wasn’t going to post today because of the Primitive Christmas Blog Hop that is going on…PS…You many want to comment on that post as well…PS they have upgraded our winter storm to a BLIZZARD!!! My Puppies are going to love it!!! I have the small rotating mat and LOVE it! Thanks for the tip. I have the small rotating mat and when i remember to use it, always wonder why i don’t use it more often.. Thanks for sharing. I have a small rotating mat that I have by my machine and I love it. Red is my favorite color and maybe I need one of the red mats too. Always enjoy your posts and have stayed at the Primitive Gatherings house and have enjoyed it. I do have a small rotating mat but really haven’t put it to good use yet. As for the red ones I haven’t seen them in the stores yet but it looks like a real good idea. I have thought of buying the rotating mat but haven’t because of the expense and I was not sure it was really worth it. I will have to reconsider now that I have your recommendation. Enjoy the blizzard. I would love a snow day but I don’t see it happening her in LA. I hope the little sheep print is in the collection of the snow man Gatherings! Can’t wait to see the collection. Hi Lisa, I love to use my rotating mat for cutting all my the tiny pieces. It works great!! I love your coming fabric line snowman gatherings!!!! I’m really looking forward to it and I have the perfect pattern in mind to use it for!!! I have a rotating mat and find it very useful, but the red one is intriguing. i have the rotating mats. I love them, but i’m so hard on them! I tend to scratch my mats. How do you have snowflakes on the comments! Totally love the rotating rotary mat. 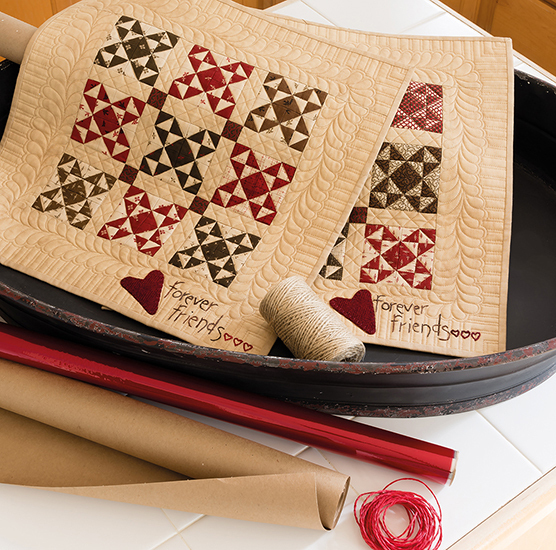 The red mats are cool too…but, nothing is as great as your new fabric line! There are about 10 projects I want to make with it. Can’t wait!!! I think I need one of those red mats…everything is better when it’s red! The red mats would look better in my sewing room too ! I love the rotating mat… saves a huge amount of time and I think I am more accurate! I am teaching my sister to quilt and even though I have some of your needful things already I am looking forward to putting together ac”Lisa” package for her birthday… since she has very few tools. Loved the peek into your home on the other blog. I love my small rotating mat! I think I’ll have to save up for that large 17″ rotating mat. What a time saver mine is plus helping with my accuracy. Oh my, it’s snowing again on your comment page…love it! I’ve looked at these but never treated myself to one……but it is Christmas! Gorgeous! Anyway we can obtain source info for the shelf in your entryway and a couple of the patterns for quilts that are not antiques? Thanks! Ohhhhhhh wow!! I LOVE *RED*!! Thanks for the chance at your give away! Like the red mat, it is a pleasant change from green,,Has the blizzard hit yet, sometimes they can be fun. Ah, red mats. Guess I know what I can get my friend who loves red for a present next year when we go on our retreat. Thanks for that update. I have wanted to try the rotating mats, thanks for the info and little push to try one. A blizzard, it is 80 degrees in TX!!. christmas list. I keep a small one by my machine where I trim small blocks after pressing before I sew to next block. Thanks Lisa for all the great tips, I’ve really enjoyed them. Hope the blizzard wont create any problems for you but at least it might mean a White Christmas! If I got a red mat my sewing area would look quite festive with the green one I already have. Thanks again for the ideas. My daughter loves her rotating mat, perhaps I will have to borrow it and give it a whirl. I tend to be very hard on cutting mats. I don’t have alot of room, so have damaged mats by putting hot iron down on them. Not good. Then you have this big “waffle” area which is difficult to cut around! I have a small rotating mat but really need to remember to use it more. A red mat would be a nice change of pace. I can’t wait for your new fabrics to come out – I love them all!! I love my rotating mats! I been working on a Farmer’s Wife quilt and the rotating mat makes working on those smaller size blocks much easier. I haven’t seen the red mats before – maybe a last minute addition to my Christmas wish list : ). A mat that rotates sounds wonderful but I have been reluctant to own Olfa mats because they smell so bad in the stores. (Am I the only one who thinks that?) Red is my absolutely favorite color and I think a red mat would be just the “pop” I need in my sewing room. I’m hoping that I’ll find one of the mats in my stocking. Your home and decorations are gorgeous. I love the red Olfa mat-I’m going to have to get one because all the accents in my quilt room are red and it would be sooo cute in there! A rotating mat is a great idea! I haven’t bought a new mat in years and years. Some one tall me about the rotating mat so I bought it and forgot about it, and one day I don’t know why I used it and discoved that it’s really a “must have” next to the machine …. so helpfull when you need to square things up! I actually put a new cutting mat on my “Wish LIst” to the hubby….i had to update it to the Red one, its all about the color! I have never heard of rotating cutting mats, i’ll have to check into that soon. 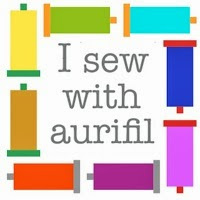 Thanks for all the quilting advise, its fun on my end to read & learn. i’ve a 12″ rotating cutting mat that i love, use all the time, even if i don’t have to rotate it. it’s so handy! who needs red mats? love green! ‘specially the 18×24″ one with the half inch grid on it! I was not able to comment about pressing your fabric with starch before cutting. I wish I had done that on my current quilt. I am using a piece of older Moda…like 11 plus years old. It had been washed, so I didn’t think it would shrink. I steam pressed it prior cutting. I also made other blocks from the same pattern and the only fabric that chaged was the Moda. Every Moda block was about 3/16″ short. I don’t think I miss cut all the 1 1/2″ strips I needed to make the 31 blocks. Before I use this Moda fabric again I am going to starch press it. If I still have problems with it I think it will become a backing or something where shrinkage if not so much an issue. I have not had this problem with recent Moda’s, so I don’t want anyone to think Moda is not a good fabric. I have the 12 inch rotating mat and love it. I have a rotating mat and also find it very convenient to use. I LOVE Snowman Gatherings! 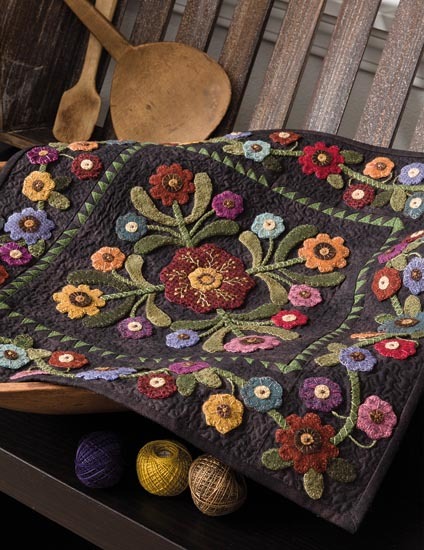 I love everything about it–the colors, the designs, the patterns you’ve made for it! Can’t wait for it to become available! I’m just south of Wisconsin in Libertyville, IL, and we are waiting impatiently for some snow. Maybe today, but maybe not. Send some of that blizzard south of you! A RED mat! That may just be the thing I need most! Love the tips you are sending our way. Loving your tips. I have the small mat, but don’t use it well. Must be missing something. Hmmmmmmmmmmmmmm. I think I’m going to have to start my birthday wish list. My hubby is done shopping for Christmas. All these tips are going to cost me money, for sure! Love the red mat – – my favorite color! Be careful with that blizzard Lisa, I miss snow here in Atlanta, but not the shoveling! It can be so pretty! I need to use my rotary mats more often for their real purpose…I like that I can use it up on my ironing board to trim up as I press. I’m going to have to try out the red mat, change things up a bit. And the snow line looks wonderful! back to hunting and clicking on your website! I too am adding to my wish list to take to Road2CA next month. Will definitely be stopping by your booth. Can’t wait!!!! I love my little rotating mat to….so handy. I have the rotating mat and I love it, as I cut a lot of small pieces. I’ve not seen the red mat — that’s interesting. Keep the posts coming, Lisa, I enjoy them so much. I thought these were for the quilter who had everything. If I just can get one at a time, which one would you suggest?.?. P.s. I loved your Christmas At The Bonjeans photos…soon people will compare themselves to YOU, not Martha Stewart! My puppy will love the snow, too! I am just discovering your blog….thanks I love it!! I have looked at the rotating mats often, but was never sure…now I am…I LOVE the red ones too! My favorite color! I wonder if my husband would object terribly if I added them under the tree???? Maybe if I found him some tools??? PS I LOVE the little gatherings so am looking forward to the snowmen now….hmmmm what can I create? Enjoy the blizzard…I hope we get a little…just on the edge here in SW MN. Thanks for the great pointers and a great store! Going to check into the rotating mats, probably add it to my list from you. We are expecting blizzard conditon later tonight along with 8+ inches of snow here in SE Iowa. I have a rotating mat and really like it. I also absolutely LOVE the red mat. Will definitely need to get one of those. Red Mats!!! Now my sewing room will be complete! I want a rotating mat and may just buy myself a Christmas present. Red mat sounds like fun, too. Thanks for all your tips. Love them!!! I have one of the smaller rotating mats and love it. There is nothing better than quilting while it snows! Merry Christmas! Michelle S.
I love that red mat! I’m hoping it comes in rotating??? I enjoyed seeing your decorations….I thought I saw a few “Willie Rays” in your photos. I haven’t found a shop in this area that displays Willie Ray items. I guess I need to keep my eyes open! Love that RED mat, I think I need that to help coordinate my sewing room….since I’m a lover of anything red. Have a rotating mat and they are great. I Love the Red mat-does the rotating one come in red also? online during your Christmas Open House. Waiting for the Kit. Oooh! A red one! I could see that helping! I’ll look into that one! OMG… OMG… A red mat…. I am in heaven… The green just is YUCK.. If you had any help getting a new color kudos to you.. I am glad to hear you talk about the rotating mat. I have not used one and was wondering if it would help with cutting smaller pieces. I am going to take your word. Red is my favorite color- did not know there were red mats! Blizzard predicted here too- I’m a nurse and drive 50 minutes to work, and they just called to say I could be on call instead of coming in- yahoo, and hoping I don’t get called. Love to be home on a snow day. 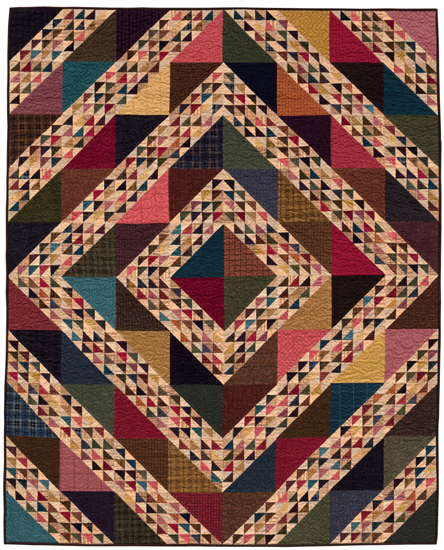 The red and green quilts are wonderful. Your home is beautiful. I have never seen the red mats but i do have a small green one. It’s almost worn out in the middle. I LOVE this rotating mat for little cuts, just spin it, cut and move on, what could be better than that. I really like my rotating mat. Would love a mat in red as red is my FAVORITE color. Ready a white Christmas. Would love to them one! Wow! Saw this product at a show a year or so ago….and forgot to go back and get it since I didn’t want to carry it around the whole show. This past year I SEARCHED for it without success….I am sure I probably walked right past it. Needless to say, this is going on my wish list…. :). Thanks. Since red is my favorite color, I plan to get the large one with my P.G. gift card I will be receiving for Christmas. Your tips are awesome. The red mats ARE a nice change! An excellent invention. Wish I’d thought of it. I love the swivel mat. It is a real time saver too. I went and got a spray handle today. Thanks for all your hints. I love snowmen so I wish we were getting snow for Christmas, too. Can’t wait to see the new line. Rotating cutting mat…the best invention! Red my favorite color, maybe it’s time to replace my green ones 🙂 because I know cutting would be more fun on a red mat. Enjoy the snow storm, a perfect time to do somethng you love, I plan on baking cookies and doing a little stitching. The rotating mat is a wonderful idea…I don’t have one yet and continue to cut my blocks by placing my current mat on my kitchen island and walking around the counter top. Also, I love the red cutting mat. I’m getting real tired of looking at the green mat! Happy holidays to you and your family!!! I clicked on the red mats link and it took me to your new stuff. There is so much tempting stuff there. Love it all. Your store is the BEST!! I put the rotating mat on my christmas list, would love to have one. I bought a spray handle yesterday and love it. We are suppose to get up to 9 inches here. Sewing room here I come. Everyone stay home and stay safe. Gotta have the red mat. Not seen that before. I do own a small rotating cutting mat. Love it!!!!! It’s starting to spit a little snow here……I can’t wait for our first measurable snowfall (and we are in a blizzard watch) just hope it isn’t to bad. I always feel sorry for the people that have to work in such bad weather. Thanks again, Lisa. Oooh red, I love it! The rotating mat sounds like a very good idea. Cool! A little rotating mat next to the sewing machine….now that is a GREAT idea…thank you. I have these cutting mats and they are the best. Red mat that does sound interesting. Does the color make that much difference in cutting accurately ? Hey I will try anything to be able to be more accurate. I love my rotating mat! Thanks for all the helpful tips Lisa! The rotating mat is wonderful. The red mat is yummy!! May have to order one? I’ve been pondering about getting a rotating mat for a while now. I think now’s the time! Thanks for all the great tips. I love reading them. I have not seen a rotating r cutting mat but I can imagine that it would be really useful. It would save me from reaching in akward positions or having to turn my mat by hand. I LOVE the rotating mats. Everyone should have one in every size. LOL!!! Oh yeah! I love the red mats–so tired of the green. Why didn’t someone think of this before. I would love it if they made a blue one too–my favorite color. I’m so excited about the new line of fabric. Blues and creams are right up my alley! I agree about the rotating mats–they are a time saver if you can train yourself to turn the mat instead of the fabric! I have the small version and love it. I just have a hard time remembering to use it. The rotating mat sounds like a treasure. Can’t wait for that new line of fabric to be available – love it! We live in the snowbelt of New York State (south of Buffalo) and we have only had a small amount of snow twice this year – the weather people are predicting a green Christmas for us, so enjoy the snow! I love my rotating mat!!!!!! thank you for the sheep ornament pattern….I hope I can get one made this week!!!! Your home is absolutely beautiful!!!!!!! I use my rotating mat a lot too. I like using it when I make square in squares. I love the sheep ornament from the primitive ornament bloghop. I plan to make an ornament a month in 2013 so I’ll be ready with new ornaments for next Christmas. I have the smaller one and love it! Keep saying I’m going to invest in the larger one, maybe for Christmas!!! I don’t have either one yet. You are giving me some great list ideas. I have yet to try a rotating mat, but you are temping me! Ahhh… a blizzard right before the holidays. Nice! We are supposed to get 18 inches out of this one. Hopefully we can dig out fast! i t oo use saflo and love it! love snow! I love my rotating mat, but find myself forgetting that it moves and move my fabric. Not smart. The red mats are great news. Hope they continue to make them in other colors. I need a turquoise one for my sewing room. Merry Christmas! Enjoy the blizzard with lots of baking and sewing! It would be so cool to own fabric that isn’t even in the stores yet! Awesome! I’ve never used a rotating mat before – I’d worry about it spinning while I was trying to cut? Hmmmm……. I never thought about it but why don’t they have different colored mats? I think the red mat would be wonderful to use as a travel mat to retreats, classes etc. You would always know which mat is yours. I gave rotating mats as Christmas gifts to both mothers two years ago. Both still comment on how much they love and use the mats. Glad to share some snow with you! So excited about the blues and creams in your newest line. Blue is the hands down favorite at our house. Thanks for the 12 needful things posts – it’s helpful to know what other items make our hobby easier! A red mat would look so cheery on my cutting table, and make it easier to cut green fabrics! I’ve never seen the red cutting mats. Thanks for the info! LOVE the red mat. I know you are staying busy… we are going to plan a trip to see you guys soon.. we hope! Thanks for the post about the rotating mats. I never knew how useful they could be, will definitely be checking them out. Lisa, I have never seen the red cutting mats, but I love my rotating one, will have to see if Santa can bring me a RED cutting mat. Thanks again for all your post. I recently got a rotating mat and find it very convenient….wish I could have gotten a red one though!! These vendors gotta keep coming up with something new to tempt us!! I have a mat and use it very much.Thanks for the tips!! I have a mat and use it quite often. A red one would be nice, much easier to see. Red mats? How cool! I’ve looked at green for so long I never even considered another color! Thanks Lisa for telling us about these mats. I have seen them before but never had the opportunity to try one. After your comments, I may have to take the plunge. Keep the good tips coming…. I haven’t tried the rotating mat, although I have looked at them and thought that it sure looked like a good idea…too late for Christmas, but maybe in April for a birthday present!?! Thank you for your “12 days”. I’ve been quilting a long time & have learned a lot of new info. Gotta get one of those red mats! Well, if that will help me with the curtting, I may have to get one. Now if there was something for the stitch width…. I have learned so much from your postings. Enjoy reading all your great ideas… especially about products I have never heard of. The mat looks like a really neat idea. I can’t wait to visit your store. Sometime this winter when there isn’t a snowstorm on the horizon. How could I resist getting a red and a rotating mat? Thanks for all your “bests”! I’ve been enjoying all your suggestions. I have a question about irons…I too love to iron; I still do pillow cases, sheets, even jeans! What iron do you use or what brand do you prefer? I like a heavy iron and I prefer the ‘Rowenta’ but I seem to replace them more frequently that any other brand. After a about 6 months, they begin to sputter, leak water, lose heat. I purchased several styles of ‘Rowenta’ and from different sources thinking getting them from a ‘better’ store might make a difference but no luck. I’ve used plain tap water, distilled water, 50/50 mixed water but it doesn’t make a difference. My present iron is about 8 months old and is not as hot as it was when I purchased it. So….what type do you use? Help! What a great idea to give your best tips on notions! I would love a new cutting mat. Mine is from about 1987. Still works great, but it would be such a wonderful improvement to have a rotating mat! I didn’t know there were red mats. How fun is that. I am really enjoying all your ideas. Thanks! That red mat would be a nice change. And I already picked up two of your suggestions, the 4″ x 8″ ruler and the marker, early Christmas presents! I love these mats. and now I am going to have to order a red one. Our house is being built and we hope to be in by the end of January. I can’t wait to get in my quilt room. I think I need to buy a rotating mat after reading your blog! I say…let it snow * let it snow * let it snow! Love the new fabric! The mat board looks really helpful. The red mats look awesome. I’m due for a new one. SNOW DAY TOMORROW ! Perfect for staying in and quilting all day long with a big pot of soup. Also LOVE the snow effect on your website. Love rotating mats, especially the small one for working on small quilts and those teensy triangle squares! I found one from Fiskars that is about a 7″ square. Handy too. I would love one of those! Maybe my husband will spring for one of those for my birthday! Good luck in the blizzard. I live in Michigan so we’ll see it after it passes you! I think the rotating mat sounds great. I have some ordering to do. I’ve used a small rotating mat before, but I think it was too small. I haven’t seen a red mat, yet – that’s something different! wow a rotating mat that sure would be handy..and I thought I already had all the fun new quilting toys….I will have to tell Santa he won’t have any trouble getting here with all this snow! The schools are closed tomorrow….hope my work will too…so I can stay home an quilt ! I might have to try a rotating mat. It sounds like it would be a great addition to my sewing room. I also live in Wisconsin and I am still at a Winter Storm Warning. I can’t wait until your new line of Snowmen are in the stores. Thank-you and keep up the great designing. Thanks for all the info about the “needful things”! Jeesh, I never stop learning! I don’t own a rotating mat, but it does seem like a good idea. Now, the red mat? Boy how I would enjoy the colour change! I have heard that red is a neutral. Whatever…those mats are beautiful. I’m ready for a change. I have never seen the rotating mat. Thanks for the info and I will be checking them out! Oh my gosh, oh my gosh, oh my gosh………that rotating mat looks incredible. It would eliminate so much strain. …and that red mat…it simply couldn’t be any cuter. Isn’t that much of what this is all about? Lisa your fabric is gorgeous and perfect for my style. Wonderful! So useful, thanks for all these great product highlights! I have the small rotating mat and just love it. The red mat looks really cute. That would be perfect for me here in Georgia with the Georgia Bulldogs and the Atlanta Falcons!!! Thanks for all the hints. Red mats? How festive! And I love even the sound if your new line! I have the small rotating mat and you reminded me that I haven’t been using it. Sometimes it just isn’t big enough so I may have to invest in the larger one. Thanks so much for these posts, I am really enjoying them. It is so generous of you to share your knowledge with us 🙂 I have another brand (Fiskars) of rotating mat that does not rotate very well, I was very disappointed. I will try this brand out as I was saving to order a Brooklyn Revolver but they are a little more $$ but do definitely revolve very well. Merry Christmas to you and your family!! Just loving your daily tips and the chanes to win. I think my next mat purchase will be red. Oh my! LOVE LOVE LOVE the RED mat!!! I have this mat and love it, you are right about the accuracy because of not having to move the fabric as much. I have the small green mat…might have to add the larger red one in 2013! I love my rotating mat and those red mats look great. I might have to put a word in Santa’s ear that I would like one for Christmas. Enjoy the snowstorm! I like the color, sure beats green!! Have fun in the snow!! I used to have a swivel mat, until someone ironed on it. A replacement is on my wish list. The tips are great. Red is my favorite color. Never thought I see a red cutting mat! Thanks for all your posts. Wow, how sweet is that. What a great addition to my quilting tools. Red is my color! I would love a new mat. My husband wrecked mine and tried to fix it for me……you can imagaine how that went. HaHa Merry Christmas to you and yours. I have the small rotating mat, I didn’t know there were 2 sizes. I haven’t seen the red mats yet, how cool is that? Thanks for sharing all this info. I love to find out about new products! I love the red mat, have never even seen one like that before…sure would be fun to have one!! !